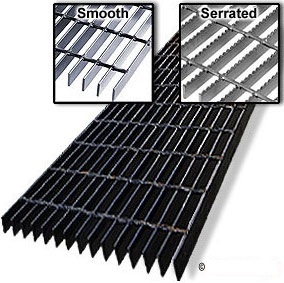 Packing conditions of Steel Grating:normally packed in pilling up ways with two pieces of square wood on both upperand bottom sides. there are four or six pieces of M10 long bolt penetrading the gratings and screwing together. it is suitable for loading and unloading by fork-lift and crane. Specifications 1>Bearing bar pitch: 30, 40, 60mm 2>Cross bar pitch; 50, 100mm 3>Plain, Serrated, I-shape 4>Hot-dipped galvanized, Painted. Product description 1) material: carbon steel or stainless steel 2) cross bar pitches: maybe 24-200mm, of which 50mm, 76mm and 100mm are recommended. 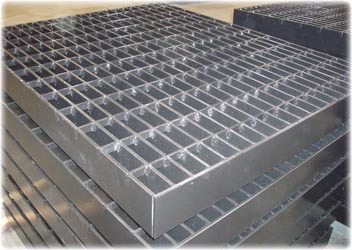 3) Steel grating is made by the world first-class equipment, which can arrange the bearing bar and cross bar in longitude and latitude order to certain distance. cross bar is pressed into the bearing bar by high tension resistance weldingring which is controlled by computer. so we can produce high quality gratings with firm welding, smooth surface and high strength. 4) Surface process of gratings: there are three types: hot-dipped galvanized , electro-galvanized and spraying brushing and soaking. anti-acid and alkali corrosion capacity the range PH6 to PH12.5, a stable protective film will be formed on the zinc surface. it has good anti-corrosive property. Looking for ideal Safety Barriers Grating Installation Manufacturer & supplier ? We have a wide selection at great prices to help you get creative. All the Safety Barriers Grating Sales are quality guaranteed. We are China Origin Factory of Enron Grating Quotation. If you have any question, please feel free to contact us.